… much more than a rest stop! The Northway is the only major highway that borders the Adirondack region east. rest area north of Albany! Need a direct link to the traveling public? knowledgeable information is provided to visitors that represent potential customers for your business. weekends all year and daily from Memorial Day through Labor Day. These promotional opportunities are provided at an affordable cost that supports the ongoing operations of the center. Attractive, inviting displays are located in high traffic areas of the Center (I.e restrooms, at/in entry and exit-ways) so that travelers may obtain brochures and literature about destinations and attractions in New York State as well as directional assistance. The cost of brochure placement and distribution is a great value for your business. Area and not the Chamber of Southern Saratoga County. 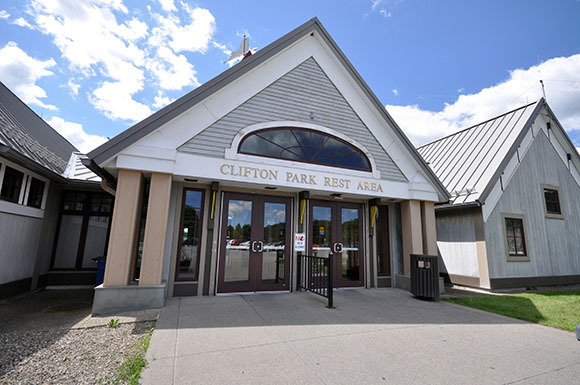 We offer distribution of your promotional and informational materials on a six month and annual basis at the Exit 9 Rest Area on the Northway (I-87). We also offer video display packages. Please contact us for details.